For artists and arts organizations, Kickstarter and other crowd-funding sources aren't just a way of gathering much-needed money. They're a way of gathering people. A way of gathering voices, ideas, community and, in many cases, an actual future beyond a one-time blowout event. That's true for Northern Spark, the all-night arts festival on June 14, whose Kickstarter campaign to reach $20,000 ends Thursday evening. So far, it's nearly met its goal, with the proceeds helping to fund security, artist stipends, rented stage equipment, staff, and more. But for the organizers, the Kickstarter campaign is also a means of sparking ongoing connection and community participation--everything Northern Spark is about. "For us, the contributions go beyond the money contribution itself, " says Molly Balcom Raleigh, Northern Spark's communications and development director. "The money is really important to keep Northern Spark going, but the Kickstarter campaign is also about people feeling like they have ownership of Northern Spark and its future." 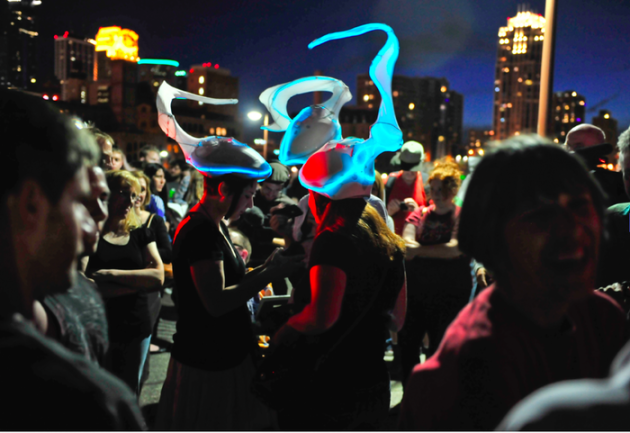 Inspired by Nuit Blanche and other dusk-till-dawn events in cities like Paris, Barcelona, and Montreal, Northern Spark first launched in Minneapolis in 2011. After altering the city of St. Paul for one summer night last year, the event returns on June 14 to Minneapolis, where at least 50,000 people are expected to come out to participate in the lights, sounds, projections, videos, experiences, stories, smiles, confusion, wonderment, and awkward stranger shoulder bumps that promise to double as little Minnesota "hellos" along the crowded streets. If you haven't experienced a Northern Spark, it's an effervescent, manic, strange, lovely, anything-goes environment where buildings appear like they're breathing through lighted gills, half-real half-virtual groups of people might share a late-night dessert via a video screen, spontaneous bands erupt under the shadows of skyscrapers, saunas become portable gathering places, and, last year, a 2,000 sq. ft. replica of an architect's home was set on fire. For the organizers, that ability to forever alter the landscape is one more way of ensuring a sustainable future beyond Kickstarter—and even the event itself. The Kickstarter campaign is just the first stop in a growing gathering intent on shaping what's next. "It's a rare thing for us to get together for a reason that isn't about commerce or isn't about tragedy. It's just about experiencing what we think this city is, and how we want to be together, " says Balcom Raleigh. "Northern Spark gives us a different experience of the city, and of each other, that we can draw on when things are harder," she adds. "I think by having these types of experiences together it makes us stronger to do things together that are harder to get done....And, really, that's like resilience in the bank." Priesmeyer: What's in your alley?